Everyday and everything looks better with flowers from Falls Lake Florist! We are a friendly Raleigh, NC florist proudly serving Raleigh and the surrounding area with an assortment of floral and gift items for all ages and occasions. All Occasion Gift Ideas ~ Shop our variety of green plants and blooming plants for a gift that brings life to any room or office. Our unique gift assortment includes customized fruit baskets and gourmet baskets, home décor & accessories, plush toys, balloons, silk & dried floral designs, swags, wreaths, and topiaries. 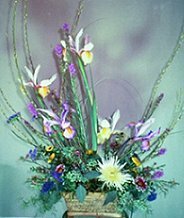 Sympathy Memorials & Funeral Flowers ~ Ask our staff about customizing a floral tribute to a departed friend or loved one. You can depend on us to help you choose flowers that beautifully convey your expressions of sympathy and serve as a lovely memorial to the deceased. Wedding Flowers & Special Events ~ Whether time-honored and traditional or modern and contemporary, we design bouquets and floral arrangements to reflect a bride’s individual style and budget. Let our expert floral designers help you plan a truly magical event with gorgeous, unforgettable flowers! We also offer these services: On-site Holiday Decorating (for home & business), Wedding Rentals (including silver-plated, wrought iron & bronze candelabras and containers), Rental & Floral Delivery/Set-up/Pick-up. 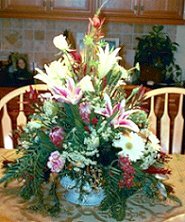 FALLS LAKE FLORIST offers daily deliveries to all local funeral homes and hospitals. 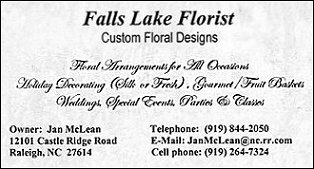 A member of Raleigh Chamber of Commerce, Falls Lake Florist has received recommendations from the Better Business Bureau and also won 2nd place at the 2004 North Carolina State Fair Floral Competition.